Demond Wilson grew up in Harlem, New York. At the age of 12, Wilson’s appendix ruptured, almost killing him. At that time the young Wilson vowed to somehow serve God as an adult in some ministry capacity. Wilson served in the US Army from 1966–1968 and was in the 4th Infantry Division in Vietnam where he was wounded. Upon returning from Vietnam as a decorated veteran in the late 1960s, Wilson was featured in several Broadway and Off-Broadway stage productions before moving to Hollywood where he performed guest roles on several television series such as Mission: Impossible and All in the Family and acted in films such as The Dealing in 1970 and The Organization in 1971. His films include “The Dealing” (Warner Bros.), “The Organization” (Sam Goldwyn Studios), “Full Moon High” (Indie), “Me & the Kid” (Indie) and “Hammerlock” (Indie). Wilson lived in Conroe, Texas for many years until 1983, when he became an ordained minister, fulfilling his childhood vow. Later, in 1995, he founded Restoration House, a center that helps rehabilitate former prison inmates by providing mentoring, spiritual guidance, and vocational training. Demond accepted the call on his life in 1983 when he preached the gospel of Jesus Christ around the world, and across America. He formed Restoration House of America in 1995, for the rehabilitation of former prison inmates across the racial divide. Demond has written eleven children stories and his book, “The New Age Millennium: An Expose of Symbols, Slogans, and Hidden Agendas”, is in its second printing. He has written two screenplays titled “Nat Tyler Freedom Fighter”, and “Bay City Blues”, and has written a sitcom titled “Hawkins for the Defense”. His latest book is titled “Second Banana: The Bitter Sweet Memoirs of the Sanford and Son Years”. I received this in December. Sorry for the delay in posting. Hey Jack, I received my copy of “When We Came Home” and I am about to the half-way point. I guess that I was fortunate in my homecoming. Got discharge from Portsmouth Naval Hospital, Portsmouth Va., via Nav Sta Norfolk. I have family in Norfolk so was able to just take a city bus home. My state of mind was such, though, that I contacted a friend in California and he invited me to come out and spend some time with him and his family. This was the summer of 1966. By fall of the following year I had enrolled in a junior college and after a year there was able to transfer over to Cal Poly Pomona. I graduated in 1974 with a BS degree. During my college time, I hitch-hiked around the country from coast to coast, the Sierras and Grand Canyon and lived in a teepee for a couple of years. That gave me time enough to settle myself down and more or less worked my emotions back into some sort of shape. What has really helped by joining these various vet’s groups and hearing their stories is how we have all been sharing similar feelings re the war and coming back to the world. I thank the good Lord for walking with me in my travels both here and one there. I had contemplated suicide a couple of times while in Nam and, thankfully, was able to avoid it. I am 82 now going for 83 and have a good life I look back and think about. I can only pray that the peace I have found can be found by my fellow veterans, and especially those returning home from the battles of today. Take care and God bless all. This is the story of the combat tour of John Hedley in the Central Highlands of the former Republic of South Vietnam in 1969 and 70. The primary focus is the time he spent as a Reconnaissance Platoon Leader of “Fox Force” in the 1st Battalion, 14th Infantry, 4th Infantry Division, and how that experience developed incredible bonds and friendships, as well as hard lessons in combat leadership, that have lasted for a lifetime. It may seem strange to some that he waited almost 48 years to recount this time in his life, but the actual effort began almost 10 years ago in an effort to face his own personal demons and dragons. While sometimes a difficult experience, he was driven to document the legacy of an incredible group of young men who were thrown together in the crucible of small unit infantry combat in a small and specialized unit. I read this book with great interest and found it to be a fascinating, personal account of what it was like to be in the infantry in Vietnam. There have been many books written about the Vietnam War but I find the personal accounts the most interesting. I recommend this book and think it should be on your shelf of Vietnam books. 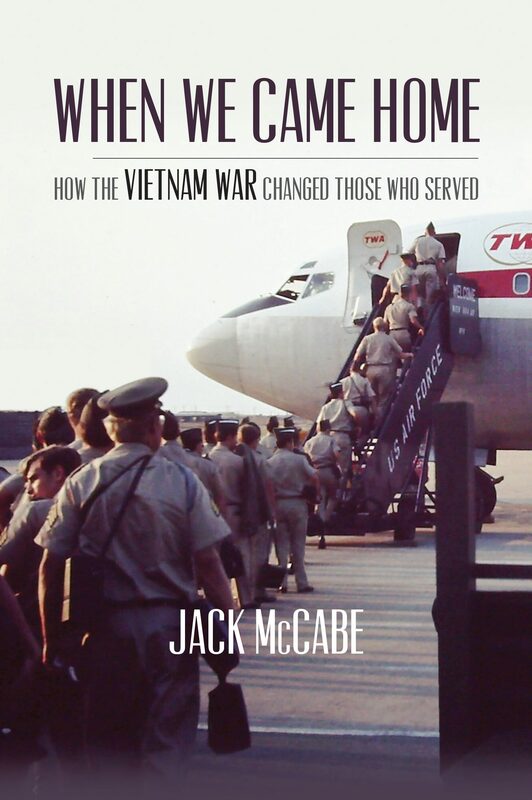 A friend who I knew had served in the Air Force during the Vietnam War left a book at my office entitled “When We Came Home,’’ by author Jack McCabe. It wasn’t fiction, and it wasn’t an author composing a piece of literature. It was a group of recollections of American soldiers and sailors about what they experienced not so much in Southeast Asia, but what they encountered on their arrival back home. The book is based on over 150 interviews and accounts. I just couldn’t finish reading it. It was just too hard and brought back some unwanted memories. I remember those years and not wanting to fly in my uniform for reduced fares on airlines because of the harassment by American civilians. I often paid more and wore civvies. I was tired of the taunts of “baby killer’ and similar derisive challenges we military persons faced in the American public. As I read many of these pieces, I was struck with another pain of those years. Many of the contributors wrote of their battle with illnesses. Many of these men and some women had severe cases of PTSD, but what was equally saddening was the number who suffered the effects of being exposed to Agent Orange. Agent Orange is an herbicide and defoliant chemical. It was sprayed over Vietnam and Laos from 1961-71 as part of an herbicidal warfare program called Ranch Hand. Used to eliminate vegetation that hid the enemy, it became even more damaging to our own troops. Up to four million people in Vietnam were exposed to these poisons, and perhaps as many as 3 million have suffered diseases from its contact. Our veterans have suffered a higher number of cases of leukemia, Hodgkin’s lymphoma and various other cancers than the general population. Yet, our own government has challenged these numbers as “unreliable,” in spite of the fact that records show 20 million gallons of various chemicals were sprayed in Vietnam during that time. Exactly eight years ago, I wrote of the horrific experiences of a local man in his tour in Vietnam. Arlen Bertrand, of Clifton, was one of the few survivors of a battle known as the Slopes of Dak To. I wrote it as a salute to a brave man who still then suffered from PTSD and disease. While the Army claims Bertrand was never “near” the spraying of Agent Orange, his life of diseases stood as a testament to the chemical warfare used around him. Bertrand, in later years, suffered from cancer of his prostate. He developed a tumor behind one eye. He lost all his teeth because of the needed radiation. He lost his hearing and, at the age of 55, was walking with a cane. Yet, Agent Orange benefits were denied, as the government would not admit he was near enough to show a relationship between the poison and his diseases. The number of dead in Vietnam is expressed with names carved on the Wall in Washington, D.C. It lists all those men and women who died in Southeast Asia during the conflict. Since then, a few names have been added where the conditions surrounding their deaths were closely tied to that war, though they died later at home. I have written of one named Alan Brudno who was the first suicide upon his release as a POW. Through the tireless efforts of his brother, Bill, his name was added to the Wall decades later. But not all the names of those who later died as a result of that war are carved there. Those men who died later as a result of their poisoning have not been added. Yet, they died fighting our fight just as much as those who were killed in the field. The stories in “When We Came Home” illustrate the results of those chemicals in case after case. Cancer, tumors, skin diseases, and even brain deterioration are almost common in these returnees. In spite of massive legal consequences demanding compensation, most cases against the government and the VA were lost. These chemical combinations actually were started during WWII, and Britain was heavily involved. Soon, it was known their use had devastating health effects. Resolutions to ban such use were presented in the U.N. as early as 1966 stating the United States was violating the Geneva Protocol, which regulated the use of chemicals in warfare. The U.S. vote defeated these resolutions each time with their vote. In November of last year, Bertrand and his long-time companion, Lynn Luehrs, were crossing a street in Clifton to have dinner. Bert’s pace was slow, and he lagged behind as Lynn reached the other curb. On his cane, he needed more time to cross and waited in the middle of the road for a truck that had come to pass by. The truck’s extended rear view side mirror struck Bert as it passed, and Bert was killed. Another casualty of the war in Vietnam? Was he on that cane because of Agent Orange? Does it matter to our government? As I read more about Agent Orange, I discovered Rockford now has a memorial for victims of Agent Orange. At this point, there are 47 names on that wall. Forty-one died of various cancers, and six lost their lives to heart disease. The committee professes, “It does not matter what branch of service you were in or what your job was. If you were there, you were exposed.” To qualify for the wall, the deceased must have been military with an honorable discharge and a paper from the Veterans Administration showing the veteran was being treated or had a disability because of Agent Orange. For years, it was not fashionable to talk about what these soldiers did and saw in Vietnam. The war was just ugly and ended with our withdrawal, perhaps better called “defeat.” But on this Veterans Day, perhaps we and, most importantly, our government should own up and treat these soldiers as they should be, with respect, admiration and, most of all, with the medical and financial support they need in their later years. Let’s not decide the case on whether the veteran was 40 miles or 4 miles from this barbaric defoliant. To our veterans, it is finally your day, and may the newly elected improve your care. Dennis Marek can be reached at dmarek@daily-journal.com. The doorbell rang on Thursday morning, May 16, 1968, at the Fitzmaurice home. It was 6 AM, but Michael was already awake. He was always up very early sitting in his favorite chair. he was always up very early and his favorite chair. He was spending a lot of time in that chair because sitting up was the only way he could partially relieve his labored breathing. On oxygen, and in the advanced stages of emphysema, Michael wasn’t able to stray too far from his chair. Lubitza too, was up early preparing breakfast for husband daughter, Ellen, who busy typing lesson plans for her student teaching sessions that she had scheduled for the day. Despite a busy morning household, visit at this time of day we’re certainly a rarity. Ellen got up to answer the doorbell. “The first thing I saw was the Marine Corps car through the window and my heart sank. I opened the door to see a Marine standing there in his Class A uniform. He announced himself as Lieutenant Dial and asked to speak to my father. I pointed him over to Dad’s chair.” The Marine turned sharply and headed over to where Michael Fitzmaurice was seated. He stared at Michael for a brief moment before a deep breath to deliver the words, “On behalf of the Commandant of the Marine Corps I, deeply regret to inform you that your son has been killed in combat operations public of South Vietnam. Although chaos reigned all around him, Lieutenant Dial stood steadfast in his resolve to inform Michael and Lubitza about the coming arrangements to get their son’s body back to Chicago and ready for burial. Ellen Fitzmaurice held her young sister, Maureen closely to her, rigid, listening while the Marine continued his anguished duty. Maureen Fitzmaurice’s childhood was dissolving with every word uttered by the young Marine officer. “Lieutenant Dial took very good care of our family,” Ellen said. He previewed the details of the funeral service; he gave us his home phone number; he warned us that a telegram would be arriving shortly confirming Timmy’s death. I remember Dad saying that he hoped that this was all a big mistake — until that telegram arrived later in the day.” The family’s devastation only deepened when they were informed that Tim had been dead for a week. Excerpt from the book SMILE ON YOUR BROTHER – A FAMILY STILL HEARS THE ECHOES OF VIETNAM by Austin J. Nicholl with permission of the author, available on Amazon. September 11 awoke us to the threat of terrorism. It was forever bookmarked in our history as the day when life as Americans knew it, changed forever. The GHOSTS OF THE GREEN GRASS tells the story of the ambush near LZ Albany, the second and largely forgotten half of the Vietnam War battle of the Ia Drang Valley in 1965. I was familiar with the battle at LZ Albany prior to reading this book. One of the kids who lived near my grandmother, in Chicago was killed there. The battle at LZ X-Ray was immortalized in the book WE WERE SOLDIERS ONCE…AND YOUNG by Hal Moore and Joe Galloway and was dramatized in the 2002 movie “We Were Soldiers” which shows the U.S. troops’ heroic stand at LZ X-Ray. But the far bloodier engagement at LZ Albany followed, when the 2nd Battalion, 7th Cavalry was nearly annihilated. Of the roughly 400 soldiers in the battalion, about 70 percent were killed or wounded. At first glance, this book seemed very interesting to me as it told the story of LZ Albany and the story of Custer and the 7th Cavalry’s defeat at the Little Big Horn. So, I obtained a copy and started to read. And it did not disappoint. He tells both stories expertly. Once I began reading it I was captivated. “What happened out there was just a shootout in the grass, and man oh man, the enemy was ready for that fight, we were not,” said Joe Galloway. On the day of the ambush, the battalion was strung out in a long column snaking its way through the jungle and tall grass, Galloway said. When a platoon captured two prisoners, the battalion commander decided to personally interrogate them, and he called all the company commanders and their first sergeants to converge on his position at the head of the column, Galloway said. That left most of the rest of the soldiers leaderless when the enemy struck, racing through the column, killing anyone they saw. The result was chaos, said Bud Alley, a second lieutenant in the battalion at the time. In all, it is a fascinating book and I recommend it to anyone who wants to know more about the battles in the Ia Drang in 1965. Click the button in the lower right corner to follow my blog. You will receive an email every time there is a new blog post.